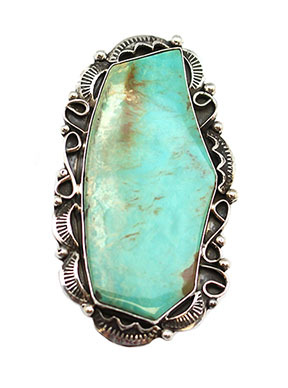 Large hand cut odd shape turquoise stone set in sterling silver and stamped scalloped and curly q border on a double wire split shank. It measures approximately 2 1/4" long by 1 1/4" wide. It is Navajo hand made by Bernita Begay. Available in size 6 1/2, 7 or 9. Stone shape and sizes will vary. You may not get shape that is pictured.